Mars Needs Moms is an adventure of epic and other-worldly proportions. The film takes you on a grand adventure from Earth to Mars and helps to expand the horizon for science fiction in film. I thoroughly enjoyed each moment and was awe-struck and amazed at every great graphic and visual effect put forth into the making of the film. The Simon Wells directed film was produced by Robert Zemeckis and stars Seth Green, Dan Fogler, Elisabeth Harnois and Joan Cusack. The film will become available in Blu-ray 3D, Blu-ray, DVD and Digital Download on August 9th, 2011. The plot is unique and original and focuses on the abduction of a young boy’s mother. The boy, Milo, sets off to chase after his mother’s captors and rescue her, but is soon thrust to Mars and embarks on a daring and fierce adventure to rescue her from the clutches of Mars’ fierce and evil leader, The Supervisor. Milo soon meets the bumbling, but experiences Gribble, who helps Milo on his quest and teaches him about Mars. The film is beautiful and is a massive step in animation. The film had me throwing together my own thoughts on the possibilities of digital effects these days and kept me intrigued to see what exciting effects that would come in the film. The are at an unparallelled quality and have obviously been given the utmost care to become such great and riveting visuals. The music had its tense moments, its sad moments and its joyful moments. Every piece of the score fit in perfectly with the scene that was being portrayed and matched with the emotional core of each character. Moments of sadness were fraught with sorrow and moments of joy were greeted with pleasure. The music was a treat for the ears as the visuals are to the eyes and the plot to the mind. Every role was played with perfection with the use of vocal recording and motion capture animation. The credits featured a brief glimpse into the making of the film and struck me as challenging yet enjoyable. The actors seemed to be having a blast in their portrayals and the film was shot brilliantly. There was never a dull moment in the film. Every new piece of the plot came with pleasured welcome and the climax was exciting and worrisome. I was expecting the film to be enjoyable and fun, but not as fun as it turned out to be. It took me for a ride and brought me from Earth to Mars along with the characters. The film was worth the viewing and I expect to return to Mars to view it again and again as it grows to become a classic as I lean into my older years and raise my own children upon this film. It is enjoyable for all ages with a few minor moments of a more adult nature. The fun never stops and the plot always thickens leaving Mars Needs Moms with a special place in my heart and thoughts. 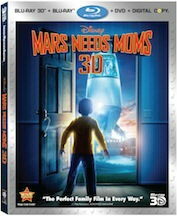 Comments for “Mars Needs Moms” – An Exclusive Review are now closed.